This small, attractive family-friendly hotel has a large lobby area with comfortable seating, 24-hour reception and check-out services, and currency exchange facilities. There is a children's playground, cafe, bar, restaurant, hairdressing salon and a garden with banana and palm trees. Internet access is available for an extra fee, as is the laundry service. Guests arriving by car may leave their vehicle in the car park. 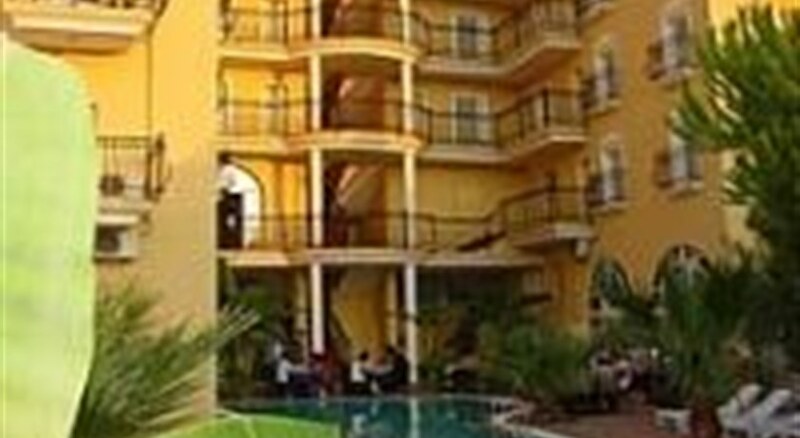 The air-conditioned establishment offers 28 rooms in total. 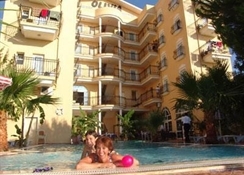 LocationThe hotel is located approximately 500 m from Long Beach and 5 km from the centre of Kusadasi. There is a shopping centre with a cinema about 1 km from the hotel and public transport runs in front of the hotel with easy access to Kusadasi and nearby towns, such as Selcuk (40 minutes), the ancient city of Ephesus (35 minutes) and the national park (35 minutes). Pigeon Island is 15 minutes on public transport and Izmir-Adnan Menderes and Milas airports are 73 km and 75 km away, respectively. RoomsThe complex has one-bedroom apartments as well as hotel rooms and all are equipped with an en suite bathroom with a shower, a double bed and individually regulated air conditioning and heating, and a private balcony or terrace. Other in-room amenities include a hire safe, satellite TV, a direct dial telephone, Internet access and a mini fridge. 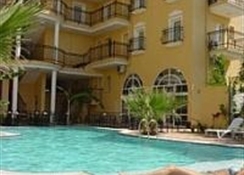 SportThe hotel has an outdoor swimming pool and a separate children's swimming area and a poolside snack bar. Sun loungers and parasols are provided free of charge by the pool and for a fee on the sandy beach. Guests looking to play a little light sport may enjoy a game of table tennis. Kusadasi International Golf Club is just 11 km from the hotel. PaymentMasterCard and VISA are accepted as methods of payment.